This mini cone incense is perfect for those that love incense but are tight on space or just have a fondness for mini trinkets. 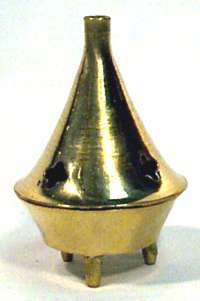 It has a sleek brass bell shape with star cutouts and a chimney for the incense to billow through. Measures approximately 2 1/2" tall.